Join us at the Gadget Show Live in Birmingham this week! | What Hi-Fi? Join us at the Gadget Show Live in Birmingham this week! We're exhibiting up at the Gadget Show Live in the NEC, Birmingham all this week so come and join us if you can. 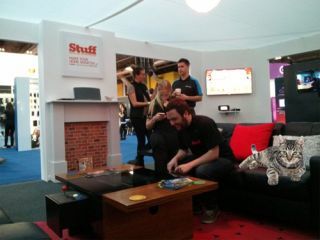 We've built a 'smart home' with the the help of our colleagues from Stuff and British Gas – you can find us in the Home Innovation Village, Hall 9, stand C180. A member of the What Hi-Fi? Sound and Vision editorial team will be on hand each day to answer your hi-fi and home cinema queries, you can pick up a copy of the magazine and check out the latest tech in our home of the future. There are even some great prizes to be won. We'll also be presenting a live demo every day at 5pm in the Hub Theatre, explaining how to get smart TV, stream music wirelessly around your house and make the most of your digital music collection. The Gadget Show Live runs from April 3-7 at the NEC in Birmingham. Check out the show website for opening times, ticket prices and to book online. See you there!